Media captionChampion of the avant garde dies. 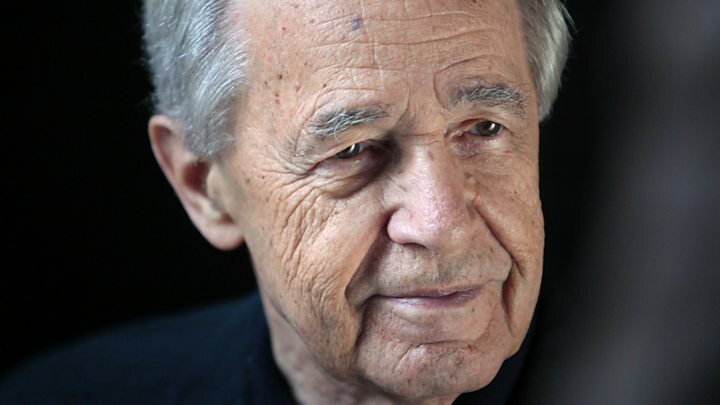 French composer and conductor Pierre Boulez has died at the age of 90. "For all those who met him and were able to appreciate his creative energy, his artistic vigour... will remain alive and strong," they said. French Prime Minister Manuel Valls paid tribute to Boulez on Twitter: "Courage, innovation, creativity, this is what Pierre Boulez meant to the world of French music, of which he made a beacon of light throughout the world." French President Francois Hollande said in a statement: "Pierre Boulez made French music shine throughout the world. As a composer and conductor, he always wanted to reflect on the ages." Boulez had been considered one of the most influential voices in the contemporary music since the 1950s and, as a conductor, he was in demand on both sides of the Atlantic. One of his particular trademarks as a conductor was that he shunned the baton, always choosing to conduct with his hands. As a composer, Boulez's work was noted for its difficulty, with one of his most celebrated works, Le Marteau Sans Maitre, being inspired by the complexity and lack of formal artistic structure of surrealist poetry. Born in the Loire region of France in 1925, Boulez began his musical career at the Conservatoire in Paris, one of the world's most celebrated music schools. He graduated in 1945 and, still only 21, became musical director of the theatre company of Jean-Louis Barrault and Madeleine Renaud. During this period he composed violent early pieces such as his first two piano sonatas and Livre Pour Quatuor for string quartet. Pierre Boulez was a truly great artist who ranks - in my book - alongside the likes of Marcel Duchamp, Jean Prouve and Albert Camus as an epoch-defining 20th Century French intellectual. He was not easy. He could be enormously charming and utterly horrible - sometimes to the same person in the same conversation. Music was his art form, agitation his style. He had no time for the status quo, and even less for the days of yore. He was a modernist - a man who sought to make some sense of the absurdities of the world in which he lived through the medium of music. It was a new age with new problems that he believed demanded a new sound. The flowery, romantic classical cannon didn't resonate in his mechanised Parisian infrastructure full of hard edges and cold steel. Something sharper, less melodic and altogether more complex was required. He championed the original modernist avant-garde of Stravinsky, Bartok, Berg and Messiaen (his tutor), while also supporting pioneering peers such as Ligeti, Birtwistle and Stockhausen. His own compositions, which were relatively few in number, have come to be highly regarded. If I were to choose one work it would be Notations, his 12 pieces for piano. It is spiky, difficult, unpredictable, poetic, and unsurpassable. Just like the man himself. Boulez's career as a conductor took off in the 1950s, during which time he performed with the Sudwestfunk (South-West German Radio). He also began acting as guest conductor for some of Europe's leading orchestras and festivals. Boulez's talent led him to be more and more in demand and he was appearing widely as a conductor by the 1960s. He led the BBC Symphony Orchestra from 1971-75 and from 1971-77 was also music director of the New York Philharmonic, where he championed contemporary works - a contrast from his acclaimed predecessor Leonard Bernstein. Increasingly, Boulez became exasperated with what he considered to be the suffocating conservatism of the French musical world, prompting him to make his home in Baden-Baden. His rebellious nature also led to him once being briefly detained by Swiss police on suspicion of being linked to terrorist activities in the period of heightened security soon after the 11 September US terror attacks. Swiss authorities confiscated his passport in the town of Basle, where he had been conducting at a music festival, after discovering he had said in the 1960s opera houses should be blown up and therefore considered him a potential security threat. Alongside his conducting, Boulez's creative output flourished as the director of the experimental music studio, the Institut de Recherche et Coordination Acoustique/Musique (IRCAM), where he had access to the latest computer technology. But he stepped down from this position in 1991 to devote more time to conducting. In 2009, he joined with fellow conductor Daniel Barenboim to conduct the complete symphonies of Gustav Mahler at Carnegie Hall, New York. Overall Boulez won 26 Grammys and multiple other honours, including Sweden's Polar Music Prize, Japan's Praemium Imperiale and France's Ordre des Arts et des Lettres. He was also inducted into the Gramophone Hall of Fame in 2012. BBC Radio 3 Music Matters and Proms presenter Tom Service said Boulez leaves "one of the most resonant legacies of any composer of the post-war period". "The scale of Boulez's achievements across the whole of musical culture means that he will never truly disappear into the past tense. As listeners, performers, and composers, we will all be living out his legacy for generations to come."